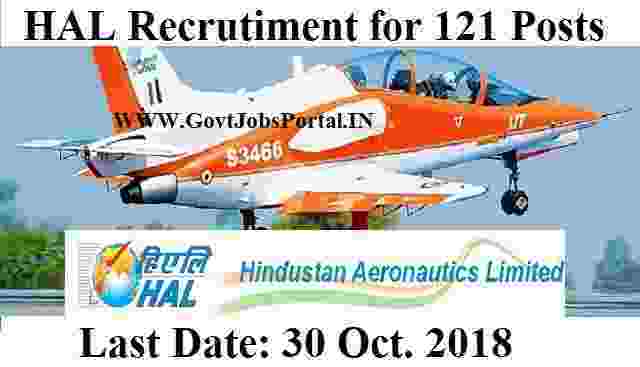 HAL is stands for “Hindustan Aeronautics Limited” is one of the organization under Government of India looking to fill up the vacant positions of Trade Apprentice posts. 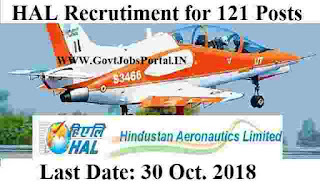 HAL Recruitment department issued an official notices in which they said that there are total 121 vacant positions of Trade Apprentice posts. So department decide to conduct a recruitment process for the selection of the fresher candidates for these vacant positions. So those applicants who are Eligible and passed in their ITI course in the relevant stream, can apply for this undergoing Apprenticeship Training recruitment process under the Apprentice Act 1961, in Hindustan Aeronautics Limited, Avionics Division, Korwa, Amethi. More information related to these Trade Apprentice jobs is given below in this article. So all the candidates have to read it carefully before applying. Vacancies to be Filled: 121 Posts. Educational Qualification Required: Indian candidates who have passed 10th class examination after that completed 2 years course of ITI in one of the trade which we explained above in the table can apply for this HAL Recruitment 2018. Age Bond: Only those fresher candidates are eligible whose age is less than 27 years. Great news to all ITI Pass out candidates is that you can apply for these Government jobs for free of cost. Department is not charging the applicants for applying these ITI Jobs. ZERO application fee is required for applying. Those who are interested in this HAL recruitment process and wish to apply they have to download the application form which we shared below under IMPORTANT LINK section. Fill up the application form with your detail. After filling up the prescribed application form, you have to send by E-mail to tti.korwa@hal-india.com on or before 30.10.2018. There is no other way for applying these Government jobs. For application form check the IMPORTANT LINK section. 30TH Oct. 2018 is the Last date. Disclaimer: We took this information from the following website: “ https://hal-india.co.in”. Inside this website we found a PDF file whose link we share under Advertisement Here link above in IMPORTANT LINK section. So all rights to the above information goes to this website only.